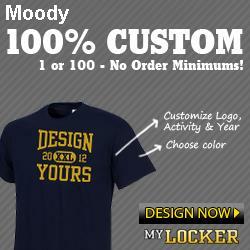 Moody Band students and parents: Included in your 2013 band fee is one t-shirt per student with the above design. If you wish to order additional shirts in cotton or moisture-management style material for yourself, family, or friends, please use the order form supplied with the 2013 marching band packet. Additional 2013 order forms will be posted soon. Extra shirts are $12.00 each. Orders are due by the first summer band rehearsal in July.